We look back at the long and successful history of men’s fashion retailer Heaphys. One hundred and seventy five years ago, the people of Redditch witnessed the foundation of a business that is still firmly rooted in the town. 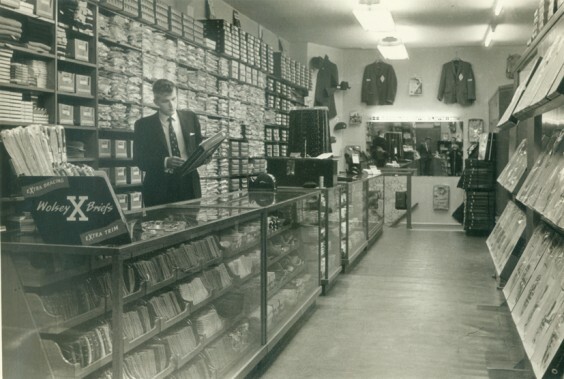 Heaphys, the well-regarded gentlemen’s outfitters which also has branches in Warwick and Rugby, was established in Redditch following an unfortunate accident in 1831. The company’s forebears emigrated to England from the Waterford area of Ireland over 200 years ago to escape the ravages of the potato famine and settled in Plymtree, Devon where Thomas Heaphy was born in 1797. The family worked as “packmen”, selling lace and associated materials to the clergy on their travels northward to Worcestershire and buying needles to trade on the homeward journey. Thomas Heaphy died in 1829, leaving the family business to his two sons, Thomas and George, who continued to trade, following the pattern established by their father. In 1830, the brothers set out on the journey to the Midlands with their stock loaded on pack horses. Following their established business pattern, the brothers bought needles and associated goods from the thriving manufacturing industry that had grown up in Redditch and the surrounding districts and prepared for the homeward journey. Sadly, just as the trip home had started, one of the horses got stuck in a ford and had a heart attack struggling to get free. Unable to make the journey home together, the brothers divided their merchandise, with Thomas returning to Devon while George stayed in Redditch trading in the town and surrounding countryside. Having established a northern base for the family business, George Heaphy set up his first stall in 1831, in an area of Redditch town centre that was to eventually become the site of the Kingfisher Shopping Centre. He returned to Devon to marry and then moved permanently to Redditch whilst maintaining links with the family business which continued to make lace primarily for the ecclesiastical community. As Redditch grew, so did the demands of the local community and Heaphys became a general textile business. In addition to workwear for industry, the firm supplied the needs of people working on the land, clothing for countrymen (and women), the landed gentry, the church and school wear. Fabrics for home furnishings and floor coverings were also sold. Throughout the 1850s, 60s and 70s, local mill owners and the Earl of Plymouth gave out clothing vouchers to church-goers at Michaelmas. The vouchers were redeemable at Heaphys for overcoats and other winter clothing and were seen as an early example of employers taking an active interest in the well-being of their workforce. Successive generations of the Heaphy family oversaw the steady growth of the business; moving first from the original stall in an area of Redditch once known as The Shambles, to a converted farmhouse on the corner of Walford Street and New Street (now the site of Redditch’s Kingfisher Centre). The last member of the family to head the business was Fritz Heaphy, a bachelor who took the reigns in 1899. Although the journey from Devon to Redditch was now a thing of the past, it is said that Fritz Heaphy still had a clear understanding of the “journey trade” and he became a familiar figure in Redditch and the surrounding districts, using the family game cart and latterly a bicycle to visit out-of-town customer. Helped by his sisters, Fritz Heaphy continued to run the business until he was joined by Cyril Nash (grandfather of the current MD Tim Nash) in the 1930s, a working relationship that continued successfully until Fritz’s death in 1952. During the time that Fritz Heaphy and Cyril Nash worked together the business expanded and the New Street premises were enlarged – ledgers show that 13,000 price tags were hand-sewn into garments each year and that the shop was the official clothing supplier to 37 local schools. In 1963 the business moved to new premises in Redditch’s Church Green, a property it still occupies today, and is used as both a retail showroom and also the base for the company’s accounts and administration departments. When the first phase of development of the Redditch Kingfisher Centre took place, Heaphys was one of the first companies to open for business, coincidentally on a site very close to the original spot where George Heaphy had his first stall in 1831. The past 20 years have seen the retail clothing business change at a great pace; the seemingly endless expansion of the multiples, catalogue and internet-based retailing and even supermarkets offering menswear – but despite this, Heaphys has continued to grow and prosper. 1985 saw the opening of a new shop in Westgate House in Warwick, which was followed in 1988 by a shop in Sheep Street, Rugby. Heaphys has customer service and strict attention to detail at its core, but this should not be confused with the business being “old fashioned” in its approach. In addition to ongoing investment in training for staff, the company has invested heavily in computer technology to keep in touch with suppliers and customers, has developed an e-business site for clients who wish to shop online, and refreshes window displays as a matter of course. Marketing well-designed, well-made men’s clothing remains at the heart of the Heaphys proposition and this is complemented by niche services not necessarily offered by competitors. In addition to off-the-peg menswear, Heaphys offers a bespoke “made to measure” tailoring service for both men and women, both for formal and business wear. Also, and almost uniquely, Heaphys supplies bespoke clothing for country sports and is one of the most reputable suppliers of clothing for riding, dressage, falconry and hunting. Tim Nash continues: “Heaphys has come a long way in the past 175 years and I believe that we can look forward to the next 175 with confidence. There have been many changes to the scope and nature of our business all of which I regard as an ongoing, evolutionary process.